Reference: USA Today‘s headline news for today: “Iraqi forces load up on U.S. arms“. The Oil-for-Firearm Program, although not officially named, was implemented in Iraq by the U.S. since 2003. The Oil-for-Firearm Program was introduced by President Bush, after he himself, President Bush, destroyed Iraq’s economy again. Under the Oil-for-Firearm Program, shipping $1.6 billion worth of M16’s to Iraq was completed in 2007. Under the Oil-for-Firearm Program, Iraq gets 85% of the weapons from U.S. only. The Oil-for-Firearm Program, with tragedies like this happening almost every week, is doomed to backfire someday, a critic (that would be me) says. The tragedies, the sacrifices, the help, the ones in need. Zhang Guanrong is trying to clean her husband’s body. 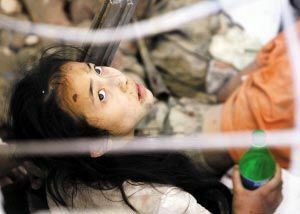 Tan Qianqiu, a middle school teacher, saved four of his students by sheltering them between a desk and himself. He did not survive. Mama, it’s dark and cold here. Zhang Jiwan, 11, lived in the remote mountainous region near the epicenter. Before he was rescued, he walked for 12 hours straight with his 3 year old sister on his back. The crying mother is trying to take a photo off an exhibiting board. It’s the most recent and the last picture of her son Wang Gongliang, a third-grader from Qushan Primary School who died in the earthquake. The photo was put there for his excellent academic achievement. 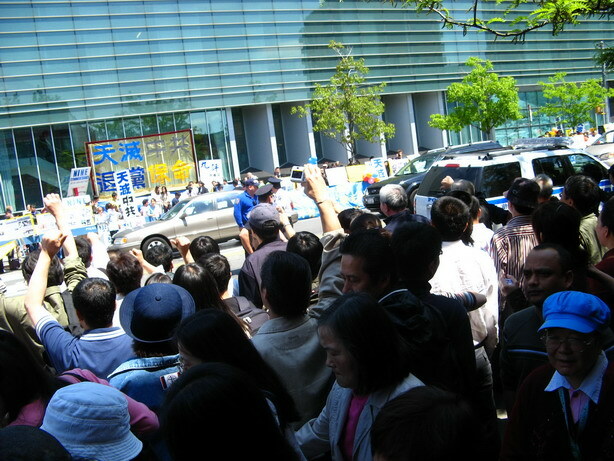 May 14, Qushan Primary school, Beichuan. Many children were trapped in the debris. Rescuers could hear them crying and begging for help, or even see them. But the building was collapsed into a structure that couldn’t be cleared up by hands or simple tools. Heavy equipments were required but unavailable because the roads to the city was blocked. The rescuers could do nothing but staying with the children and watching them dying. They felt so helpless and hopeless yet had to restrain themselves to comfort the children. Some couldn’t bear the pressure, and ran far away from the debris to cry. 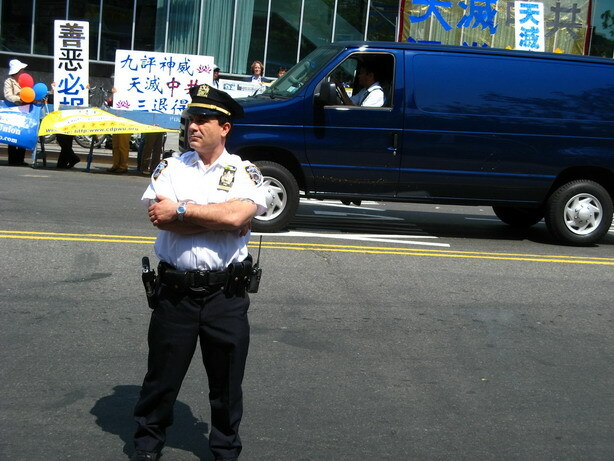 By May 16, the roads were through and the equipments arrived. It was too late for more than 600 students and teachers in the school. Only a dozen survived. These are the last words from the four-month old baby’s mother. She left the text message on her cellphone. When her cold body was found, she was in a kneel position, with her arms stretched out to shelter the baby, who was sound asleep under her without a scratch. 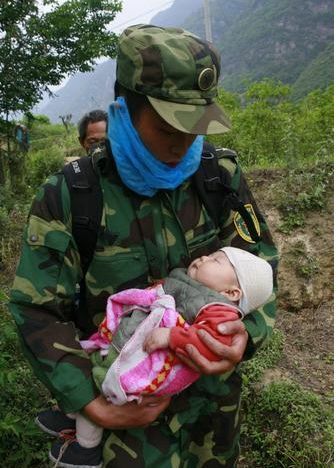 A college girl successfully helped the Chinese air force to send relief effort, by posting on the Internet, Chinese news reported on May15th, 3 days after the magnitude 7.9 earthquake in Wenchuan County. The girl, a student at Culinary Institute of Sichuan, is originally from Wenchuan. After knowing all roads to Wenchuan had been cut off by the earthquake and landslide that followed, and rescuing effort had major trouble to reach the epicenter by air due to the mountainous landscape of this valley county, she realized that a construction field near her village was probably a good location for helicopter landing. Trying to help, she posted this information online and included her contact information on May 15th around 10AM. Her post was quickly transferred to all major Chinese forums. Hours later the girl received a phone call from the emergency headquarter, asking for more detailed description. By 4PM the headquarter had confirmed the location would be used for landing. 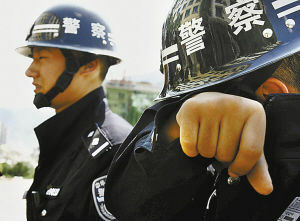 After the earthquake hit Sichuan, Chinese Internet users have shown immense concern over the life loss and rescue work. Calling for donations, self-organizing volunteer groups, spreading information, suggesting rescuing approaches, all web portals and forums have been flooded with earthquake related articles and posts. A lot of – if not most – bloggers turned to focus on the earthquake as well. Most users gave positive remark to the government’s quick response. Sichuan, the province in mountains, is famous for its difficult roads. After the quake made transportation to some places impossible, helicopter became the only choice for the rescue force. However, China does not have enough of them, especially heavier ones. The central government had issued an emergency plan to temporarily seize some business owned copters. Despite China’s repetitive requests, U.S. government still maintains a ban on exportation of heavy helicopters, a common tool for disaster relief, to China.